The primary cause of death and fatal illness in men and women is cardiovascular disease (CVD). In 1948, the Framingham Heart Study, under the direction of the National Heart, Lung and Blood Institute (NHLBI) began research into the factors and characteristics that contribute to CVD. While the tools and extent of analyses were limited at the time, pulse wave shape was an important parameter collected during the study. Researchers found that a visual inspection of the waveform patterns accurately correlated with an increased risk of developing CVD. Researchers at the St Thomas hospital recently revisited this striking observation. The St. Thomas group elaborated on the initial findings to demonstrate that finger volume pulse derived from a digital photoplethysmographic probe is directly related to the radial and brachial artery pressure pulse. Pulse is created when the heart pumps and propagates blood through the arteries. The first component of the Digital Volume Pulse (DVP) waveform (i.e. the systolic component, shown below in blue) results from the direct propagation of pulse from the aortic root to the finger. While the pulse travels down the arm, direct pulse pumps along the aorta to the lower body. This causes arterial diameter changes and bifurcations which result in part of the pulse being reflected back. These reflections culminate in a single wave reflection from the lower body that travels up the aorta then down to the finger, forming the second DVP component (i.e. the diastolic component, shown below in green). The arm acts as a conduit for both the directly transmitted wave and the reflected wave thereby having little impact on the DVP contour. The DVP waveform contours are directly related to the large artery stiffness and vascular tone. As a result, characteristics of the DVP waveform may change based on these factors. Aortic valve opens; blood from left ventricle is expelled. Wave caused from LV ejection that increase the arterial wall linearly. Reflected wave from the small artery. End-point of systolic phase, aortic valve is closed. Reflective oscillatory wave occurred from the blood crash into aortic valve by blood pressure of aorta. PWV Analysis is widely recognized by the European Society of Hypertension as integral to the diagnosis and treatment of hypertension (i.e. high blood pressure). There is a proven correlation between PWV and cardiovascular-related illness, events and death. Arterial stiffness indexes (EEl, DDI and DEI) can suggest vital information to health care professionals. The test provides a quick and objective analysis of how your vascular system is functioning. This information is useful in informing and guiding your health care professionals (i.e. data may be used in deciding to pursue treatment prior to showing symptoms or clinical signs). PWV analysis determines if the vascular system is working properly, without any limitations that may produce health risks. A healthy heart delivers oxygen and nutrients effectively throughout the body while pumping waste products to the kidneys, liver and lungs for removal. In order for this to occur, the arteries must be in good condition. Arteries may become atherosclerotic, arteriosclerotic, or hardened (having reduced elasticity and increased narrowing) over time. This change taxes the heart, valves, and arteries, which can lead to stroke, heart attack, kidney failure and/or sudden death. Arterial stiffness caused by medial calcification and loss of elasticity (i.e. aging) is the most important factor contributing to an increase in PWV. Pulse wave velocity (PWV is an effective and highly reproducible measure for evaluating vascular endothelial dysfunction (i.e. the elasticity of the artery) and arterial stiffness. Propagation of blood through the arteries occurs during a single heart systole. Blood travels through the arteries due to a transfer of kinetic energy from an area of expelled blood volume to potential energy of a stretched region of the vascular wall. Consequent changes take place in pressure, flow, velocity and profile. 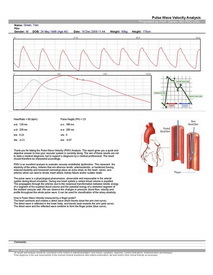 These changes are the physiological phenomenon known as pulse wave and can easily be observed and measured for use in analyzing arterial elasticity. Age is the most important factor contributing to increases in PWV. Arterial stiffness occurs due to the calcification and loss of elasticity that accompanies aging. Studies suggest that an increase in PWV may be a precursor to atherosclerosis development (as diabetes) while other research indicates no significant increase in PWV with age in subjects already predisposed to atherosclerosis (i.e. familial hypercholesterolemia). That being said, a qualitative association between the process of atherosclerosis and arterial rigidity has been established. Research shows that hypertension, more so than atherosclerosis, contributes to an increase in age-related arterial stiffening. While blood pressure is a valuable first-level indicator of hypertension, PWV provides further detail. PWV analysis measures the movement of the arterial wall by inducing movement through baroflex-induced pulse pressure. Large artery damage contributes to the increase in cardiovascular illness and death rates observed in conditions such as hypertension. Arterial distensibility associated with this damage contributes to a disproportionate rise in systolic pressure and arterial pulsatility. These factors are associated to an increase in cardiovascular morbidity and mortality. Pulse wave analysis provides insight into arterial stiffness and distensibility which is valuable in the study of aging, vascular-related disease and agents which dilate or constrict arteries. Patients suffering from diabetes mellitus and coronary artery disease often exhibit reduced arterial performance in non-occluded arteries. During atherosclerosis, the artery walls tend to thicken, harden and narrow making them less effective at absorbing the energy from the blood pressure pulse. This, in turn, increases PWV. Ascertaining the condition of major arteries is key to early diagnosis, treatment and prevention of cardiovascular-related illness. Analyzing arterial stiffness gives tremendous insight into potential health problems including heart attacks, heart failure, diabetes, and renal complications. When the heart contracts, It produces a direct wave that travels down to the finger. This wave is reflected in the lower body and also travels down to the finger. 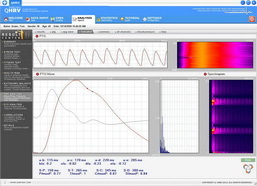 It is this combination of the direct wave and reflected wave that is measured and recorded by the finger probe. The first component of the Digital Volume Pulse (DVP) waveform (i.e. the systolic component) results from the direct propagation of pulse from the aortic root to the finger. While the pulse travels down the arm, direct pulse pumps along the aorta to the lower body. This causes arterial pressure changes which reflect the pulse back to the finger. The reflections culminate in a single wave reflection from the lower body that travel up the aorta then down to the finger, forming the second DVP component (i.e. the diastolic component). The arm acts as a conduit for both the directly transmitted wave and the reflected wave thereby having little impact on the DVP contour. DVP is measured by transmitting infrared light through the finger. The amount of light absorbed is directly proportionate to the volume of blood in the finger. 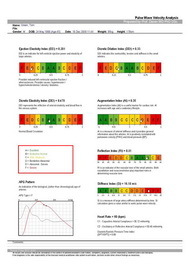 A control system is in place to maintain the optimum level for measuring blood volume changes. This minimizes the potential for inaccurate signals due to vasoconstriction or poor perfusion. The PWV System is highly effective at estimating arterial stiffness. Using the digital volume pulse data obtained from the infrared finger sensor, the PWV System determines the time it takes for pulse waves to travel through the arteries. The shape of the waveform derived from this measurement directly correlates to the time needed for pulse waves to travel through the arterial system. The speed by which the pulse travels through the arteries is directly related to arterial stiffness. Therefore, this measurement makes PWV a valuable and noninvasive tool for assessing vascular changes. The DVP waveform measured by the PWV System is independent of changes is the vasculature but rather, determined by arterial stiffness (estimated by SI) in the large arteries and vascular tone (estimated by RI). Arterial stiffness effectively measures organ health and gives insight into necessary lifestyle changes or drug treatments. It is also a powerful indicator of a number of health risks including cardiovascular-related illnesses. In addition to arterial stiffness, the PWV System effectively determines the vascular tone of the arterial tree. Using a high fidelity photo-plethysmography transducer with signal conditioning circuit, the PWV System measures the DVP waveform. A powerful control system maintains the optimum transmission level for measuring blood volume changes with extreme accuracy, regardless of finger size. The system is noninvasive and nondependent on an operator for measuring arterial stiffness and vascular tone. 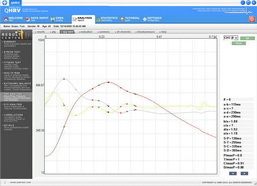 The PWV System can be used to observe and measure changes in the DVP waveform due to endothelial dependant vasodilators such as salbutamol (albuterol). These observations may be used to assess endothelium function. Salbutamol is easily administered via inhaler making this an easy test to perform in clinic or at the patient’s home. 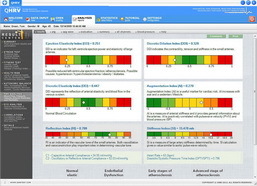 The system is useful for both managing health conditions such as hypertension, diabetes and renal disease as well as the early identification of cardiovascular-related illness. Heart disease is the most widespread illness – it affects more people than other disease. Many people may be completely unaware that they even have a heart issue until a stroke or heart attack occurs. The factors that lead to heart disease are varied and the list is growing. Lifestyle issues such as high cholesterol, smoking and blood pressure have been linked to heart attacks and strokes while other determinants like age and diabetes are known factors. All of these factors contribute to arterial stiffness which, in turn, constricts blood flow thereby straining the heart with added workload. Pulse Wave Analysis measures your blood pressure in a precise and targeted manner. 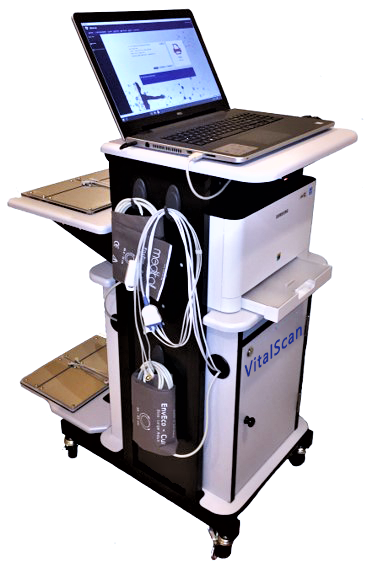 It allows doctors to assess arterial and cardiovascular health with extreme accuracy. It measures blood pressure at the heart level versus the pressure on your arm as measured using conventional arm cuff. The Pulse Wave measurement gives doctors valuable insight into the interaction between your heart and blood vessels which allows them to analyze your heart’s performance. This revolutionary technique is a complementary practice to the arm cuff measure as it provides further information into cardiac function. 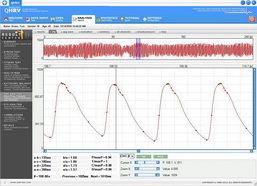 PWV Analysis is therefore useful for at-home use, in clinics and in operating rooms. PWV Analysis provides cardiologists, doctors and individuals an in-depth window into cardiac function and heart and arterial performance. The PWV System seamlessly fits into a clinic or specialized setting and provides valuable insight in a patient’s health and arterial function. This permits both the doctor and patient to make better treatment decisions. Whether for professional sport or fitness, PWV Analysis provides important information regarding heart performance and overall health. Results can be used to manage and motivate and an effective training regimen. The simple-to-use device opens a detailed window into cardiac performance and arterial health which is vital to diagnosing, managing and monitoring hypertension effectively. The PWV System is quick, easy-to-use and provides information that customers will value thereby building ongoing customer relationships. Demonstrate the effects of wellness treatments or programs on the overall health of patients using PWV analysis. Why Test For Arterial Elasticity? In many parts of the world, such as the United States and Canada, cardiovascular disease, in the form of heart attack and stroke, is the leading cause of death. Even more individuals suffer from cardiovascular-related illnesses and disabilities. The cost is staggering in both health expenditures and lives lost. It is now widely known that the endothelium health and blood vessel performance directly correlate to overall cardiovascular health. Detecting and monitoring arterial performance at this level enables early intervention and disease prevention. Aging and disease change the elasticity and performance of blood vessels. These changes impair the pulsatile function of arteries which can lead to cardiovascular events and health issues. Measuring pulsatile function, or pulse wave velocity, provides important information beyond that provided by conventional blood pressure measurements. Arterial stiffness describes the compliance, or elasticity, of arteries. Hardening or stiffening of arteries is referred to as arteriosclerosis. Arterial stiffness determines how hard the heart needs to work in order to pump blood through the body. Why does arterial stiffness matter? The performance of arteries is directly related to potential for cardiovascular events such as heart attack or stroke. Measuring arterial stiffness provides insight into the large arteries and offers early identification of at-risk individuals. Arterial stiffness has also shown itself to be a more accurate predictor of cardiovascular issues than the conventional arm cuff blood pressure method. How does PWV Analysis measure arterial stiffness? PWV Analysis is highly effective at estimating arterial stiffness. The system uses a simple and comfortable infrared finger sensor to determine the time it takes for a pulse to travel through the arteries. The speed by which the pulse travels is directly proportionate to arterial stiffness. The augmentation index and central blood pressure data derived from this measurement are both recognized indicators of large artery stiffness. How is arterial stiffness related to blood pressure? When the heart pumps blood into the arterial system, the stiffness of the arteries determines how easily that blood is transferred throughout the body. Soft, compliant arteries transmit blood easily and efficiently therefore the heart does not need to work as hard. Conversely, stiff and hardened arteries produce greater resistance to blood flow thereby taxing the heart and causing it to work harder. The strength of each beat and the resistance to flow produced by the arteries determine blood pressure. Once it is determined that arterial stiffness is an issue, a number of treatments may be sought. Pulse Wave Velocity is instrumental in analyzing the effect of arterial stiffness on overall health. It is widely recognized that aortic stiffness is an effective predictor and indicator of cardiovascular illness and events. A higher Pulse Wave Velocity in an aging, stiffened aorta, for example, causes the reflected wave (systolic) to return to the heart early. This measurement indicates an increased risk of three potential cardiovascular outcomes. Central systolic pressure increases which causes stress on the cerebral blood vessels. This can lead to a stroke. Important to note: this change may occur without any noticeable change to cuff systolic pressure. As the Left ventricular load (LV load) increases, the LV mass and LV hypertrophy are accelerated and increase. This increase in LV load is depicted by the black arrowed region. A reduction occurs in the critical diastole period due to the pressure that is perfusing the coronary arteries. This increases the risk of myocardial ischemias. Studies show that physical activity improves elasticity and reduces stiffness in arteries. Not only does exercise have a dramatic impact on arteries on a long-term basis, positive effects are apparent and measurable immediately. Post exercise, the time required for the reflected pulse wave to travel back to the heart is reduced thereby easing the heart’s workload and promoting better overall cardiovascular health. On a long term basis, combinations of aerobic exercise and flexibility activities such as yoga and Pilates have been shown to further improve the elasticity of arteries. o	Track improvement in vascular age over period of time based on a prescribed training regimen, lifestyle changes, improved activity levels, etc. Exercise produces a physiological response in blood pressure which can be measured using the augmentation index. During physical activity, the pulse rate increases and the augmentation index decreases. Meanwhile, minimal change is observed in blood pressure during periods of exercise. Once the exercise has ceased, both the augmentation index and pulse rate return to their respective resting values. The following chart illustrates a typical response to exercise as measured in pulse rate, diastolic pressure and systolic pressure. It also depicts the changes prior to, during and after the activity. An increase in physical activity causes the heart to expel more blood in order to fuel the organs. At the onset of exercise, the arteries have yet to dilate. Subsequently, blood pressure is driven upward as oxygenated blood rushes to supply the organs. This initial imbalance increases the heart workload. This increase causes in activity and spike in blood pressure causes the arteries to dilate in response. The arterial dilation permits more efficient blood flow and allows the heart to effectively deliver blood throughout the body. The arterial dilation also reduces the heart workload which causes the blood pressure to normalize whilst the pulse maintains at an elevated rate. If exercise is not a normal part of the patient’s daily routine, PWV measurements should be performed on the subject while they are in a relaxed, resting state. This will produce the most accurate assessment. The following articles and publications provide further research and data into the role of arterial health in cardiovascular health. John R Cockcroft & Ian B Wilkinson (2002) concluded that analyzing arterial stiffness could contribute to the management of cardiovascular disease. Applications for future trial were raised by Laurent et al. (2002) and methods of measuring arterial stiffness were proposed by Mackenzie et al. (2002). Techniques for measuring arterial stiffness were further discussed by Oliver & Webb (2003) as was their applicability and relation to cardiovascular drugs. These early reviews demonstrated the importance of arterial health and their role in blood pressure determination. Izzo (2004) presented the relationship between isolated systolic hypertension and arterial stiffness while Kass (2005) discussed the correlation between arterial stiffness and ventricular function. This subject was further extrapolated by Nichols (2005) and then later by Zieman et al. (2005). These important developments served as impetus for the release of an expert consensus document (Laurent et al. 2006) on methods and applications of arterial stiffness. Hirata et al (2006). The evidence for arterial stiffness measurement and potential benefits for hypertension treatment based on these findings was discussed, Cohn (2007). Michael F O'Rourke & Hashimoto (2008) published a historical review of arterial stiffness findings and Franklin (2008) indicated arterial stiffness as a new and reliable indicator of cardiovascular disease. P. Avolio et al. (2009) highlighted the differentiation between central and peripheral blood pressure while Nilsson et al. (2009) proposed managing cardiovascular risk based on vascular age. Combining cuff blood pressure measurement with the new peripheral pulse wave anaylsis was described as the future of blood pressure management by Alberto P Avolio et al. (2010). In addition to these hereditary issues, lifestyle plays an important role in the development of cardiovascular disease. Factors such as smoking and a sedentary lifestyle are also known predictors. In the absence of these traditional risk factors, specialists may examine arterial health to evaluate potential for cardiovascular issues. A high proportion of cardiovascular diseases are preventable, however, measures need to be taken early in order to avert issues. Arteries provide the crucial in-depth window into cardiovascular health to advance treatment. That said, once arteries have become significantly obstructed due to plaque buildup, specialists are limited in their ability to assess their function and structure. The PWV System enables specialists to evaluate arterial function at an early stage in order identify at-risk patients. Early screening may help in early diagnosis and/or treatment of underlying vascular conditions before they develop into more serious issues. The PWV System also enables specialists to pinpoint issues and achieve a more highly-targeted diagnostic evaluation. Finally, the PWV System enables physicians to monitor arterial health at every subsequent stage to ensure interventions are having the desired effect. Traditionally, cardiovascular analysis is primarily accomplished using measures such as electrocardiograms (ECGs), echocardiograms and stress tests. While these tests are effective in evaluating heart function, their scope is limited to the heart and, as such, these measures do not offer valuable insight into the arteries. Since it is well established that arterial health is intrinsically linked to cardiovascular function, arterial evaluation is the optimal measure. While arterial evaluation enables a detailed assessment of cardiovascular health, traditional methods of extracting information become compromised in the latter phases of cardiovascular illness. This is due to plaque buildup which threatens the functional and structural integrity of the arteries. The PWV System bypasses arterial obstruction to assess arterial function accurately and easily. •	Clinical investigation into arterial elasticity has successfully identified a correlation between reduced arterial elasticity and eventual cardiovascular events. •	Arterial stiffness is often present even in the absence of traditional risk factors and additional data has successfully linked a loss of arterial elasticity in patients suffering from hypertension, diabetes, heart failure or coronary artery disease. •	Research indicates that subtle changes to arterial elasticity provide invaluable insight into overall cardiovascular condition. Changes in arterial elasticity often precede conditions such as hypertension and diabetes and these changes are reflected in the arterial blood pressure waveform. •	Data suggests that vascular changes precede typical and overt symptoms of cardiovascular disease and the occurrence of heart attacks or strokes by many years. Further, clinical investigations have shown a relationship between the loss of arterial elasticity and aging which suggests that arterial stiffness is an early biomarker for cardiovascular disease. The PWV System enables easy, noninvasive measurement and analysis of cardiovascular health. The resultant data provides invaluable insight in arterial elasticity, stiffness and vascular changes which are all powerful determinants of cardiovascular events. Clinical analysis allows for early screening, treatment and monitoring of any significant cardiovascular issues.